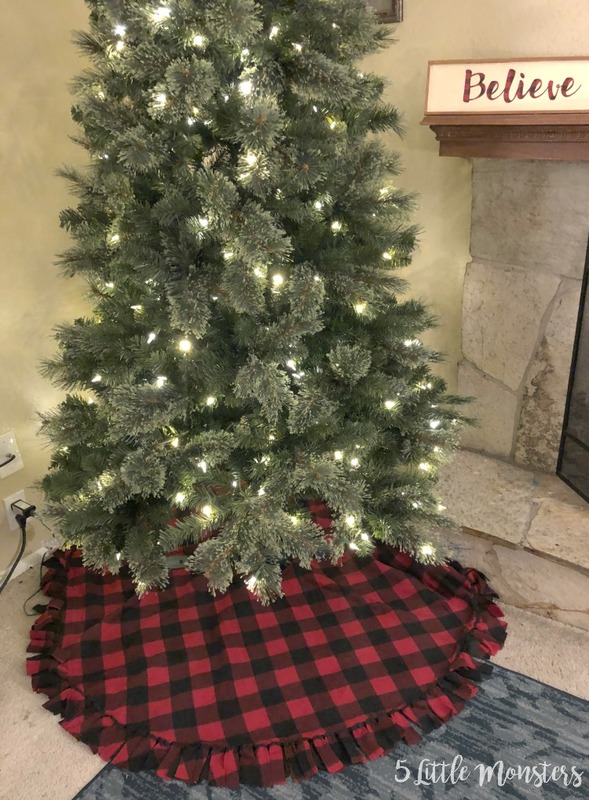 As our undecorated tree was sitting in the corner of our living room, we decided that we also needed a new tree skirt, our old one was getting kind ripped up and we have had it for a really long time. It was time for something new. We kind of ended up with an unplanned buffalo plaid theme this year. I happened to pick up some fabric for a stocking project, had some leftover and made a pillow, and used some vinyl I had ordered months ago to make a Christmas sign. Then those projects gave me an idea for a crochet project (coming soon), and all of the sudden we had a new Christmas theme. 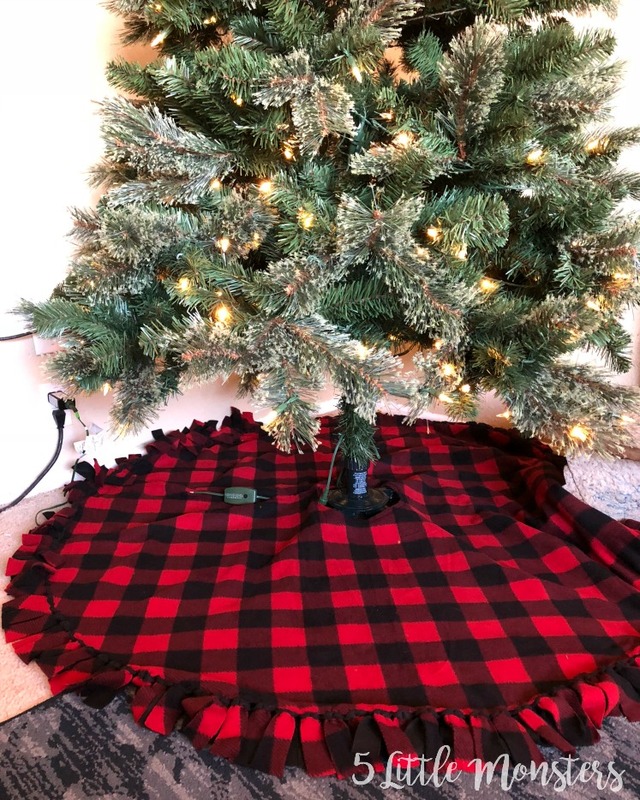 My husband mentioned that he would like to find a red buffalo plaid tree skirt since we had so much other stuff in that print, and the next thing you know we were buying fabric to make one. 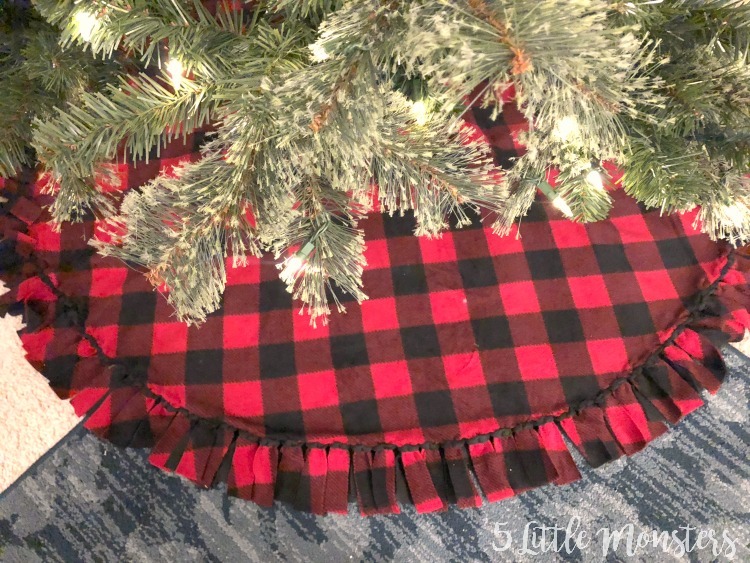 This tree skirt was super easy to make, not a no-sew project, but there is only a little sewing. 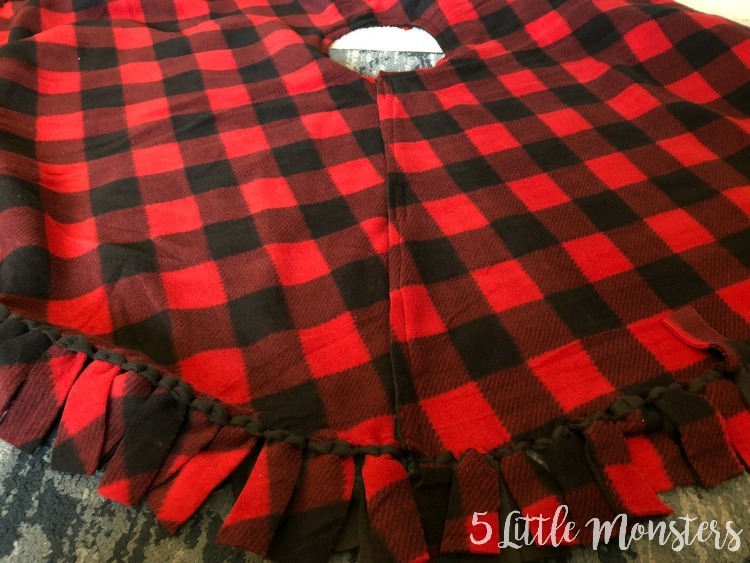 It is made with 2 layers of fleece that are tied around the outside edge to create a fringed finish. It has a slit on one side with a velcro closure to make it easy to put on. 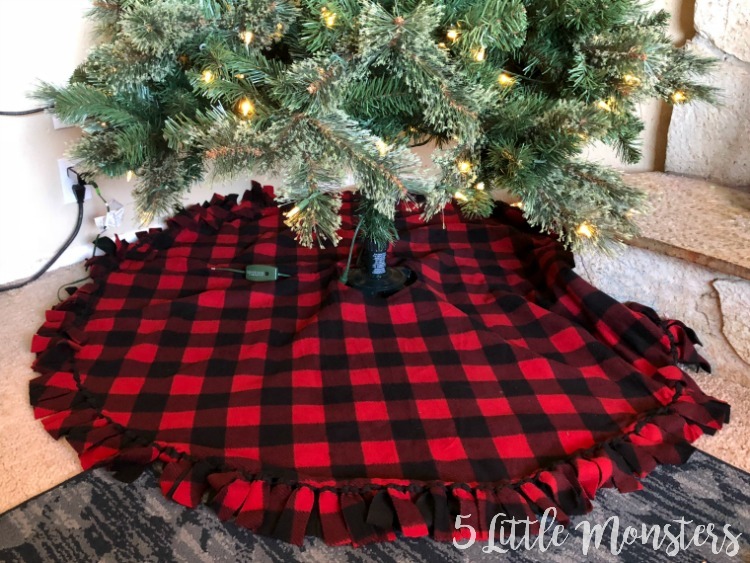 When we started talking about making one I was trying to think of the easiest possible way to make a tree skirt and I love how it turned out, now we just need to get the tree decorated. The first thing you will need to do is fold each piece of fleece in quarters to make a square, fold it first the way it is folded on the bolt, then fold that in half the opposite direction to make a square that is approximately 30" square. 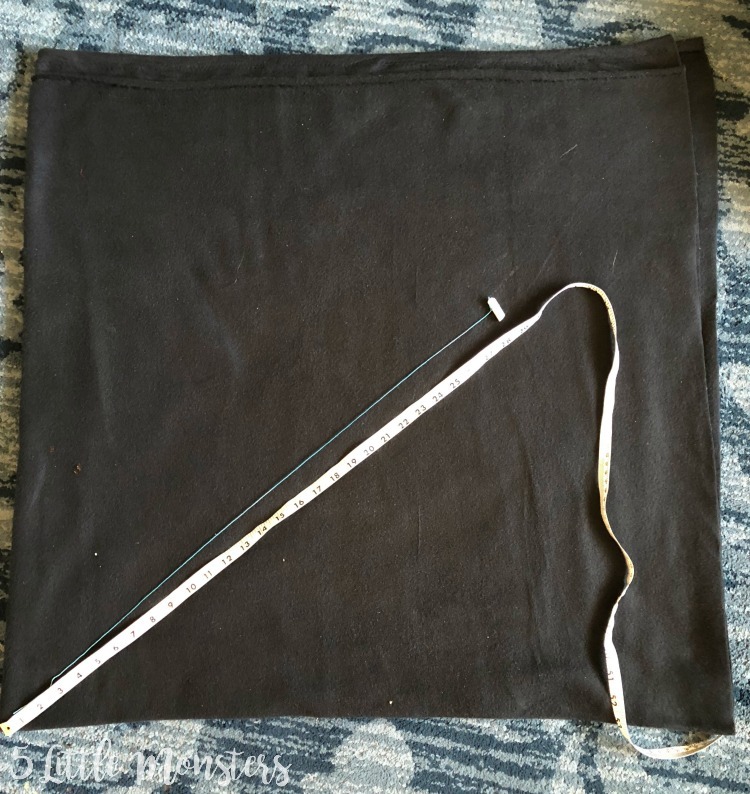 Tie piece of yarn or string to a piece of chalk and cut so that the string is 28"-29" long, just a bit shorter than your square of fabric. Hold the string in the folded corner and use the chalk to draw a curved line from one edge to the other. Repeat holding the yarn so that the chalk is only about 3" from the corner, making a smaller curve close to the folded corner. Cut along the chalk lines, cutting through all layers. 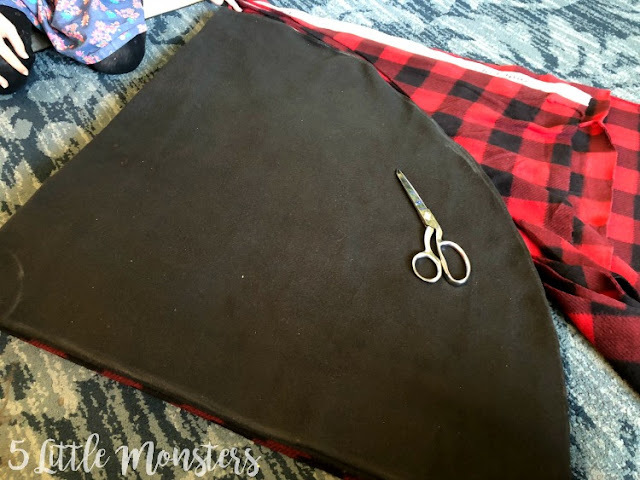 Now you can either repeat that process with the other piece of fleece or just place the folded cut piece on top of the folded uncut piece and use the cut piece as a template to cut the other piece to match. 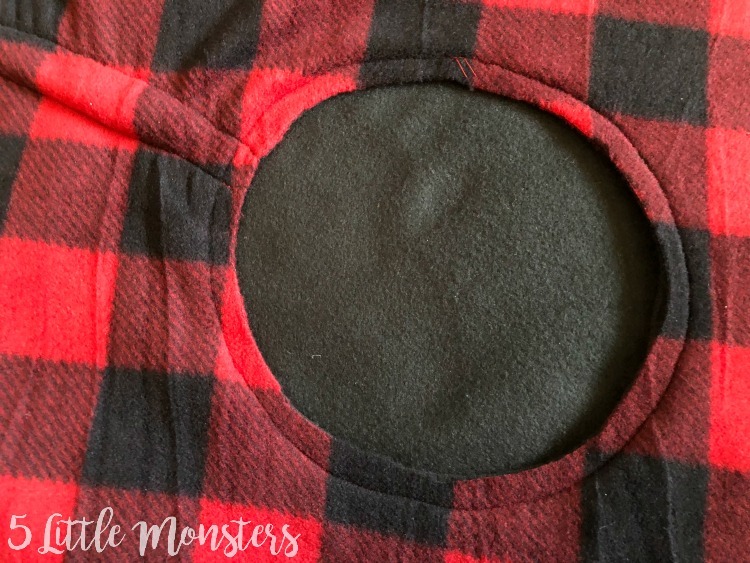 You should now have 2 large circles with small circles cut out of the center. Draw a straight line with chalk from the outside circle to the inside, I just drew it along a fold line to get it straight. Place the 2 circles wrong sides together. Sew around the circle in the center, 1/2" from the edge. Sew along both sides of the straight line 1/2" from the line on each side. Cut a cardboard template that is 1" x 3 1/2". Use this to cut a fringe all the way around the outside edge. Start your fringe about 1 inch from the line sewn from the center to the outside edge. Because the edge is curved you will need to adjust the fringe a little bit to accommodate the curve, slightly flaring the outside of the fringe. 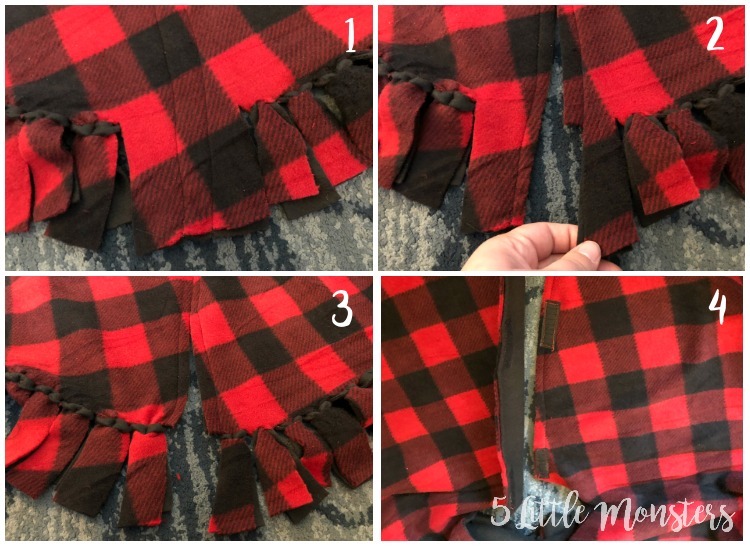 Cut a slit in the center top of each fringe, through both layers. Put the top fringe through the slit on the bottom fringe, then repeat. 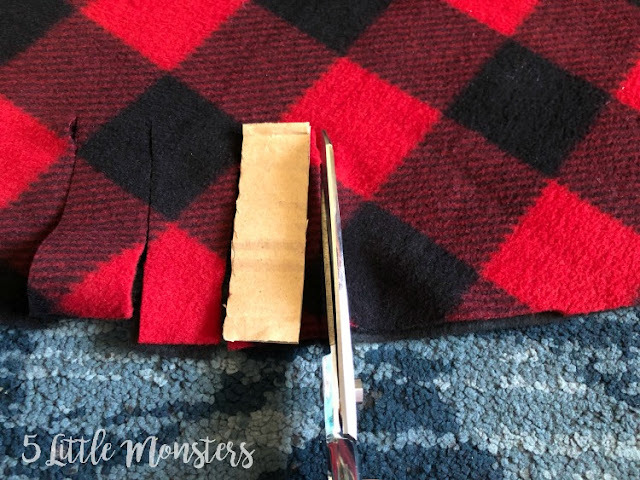 Using the colors of my tree skirt you will first pull the plaid strip down through the slit in the black, this will make the black strip on top of the red. 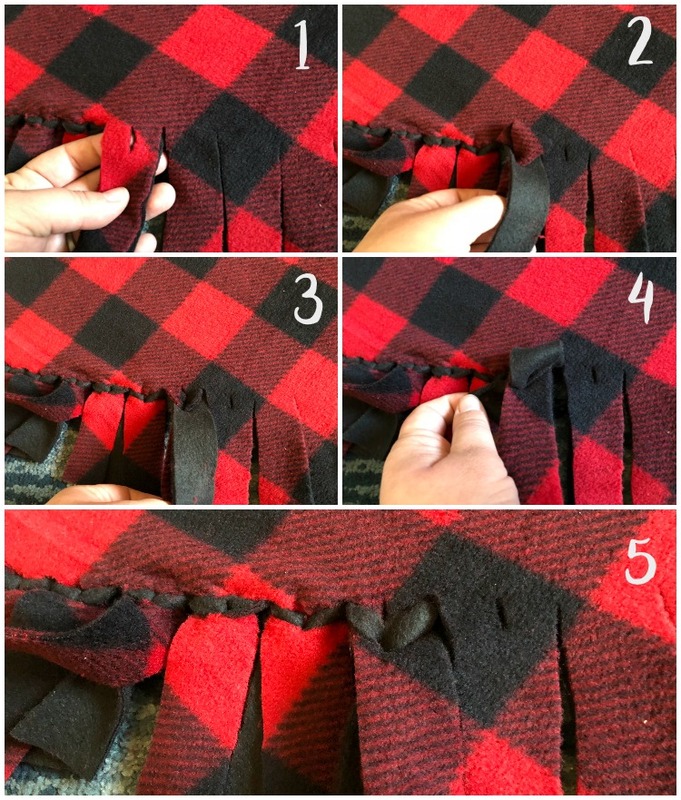 Then pull the black strip down through the slit in the plaid. 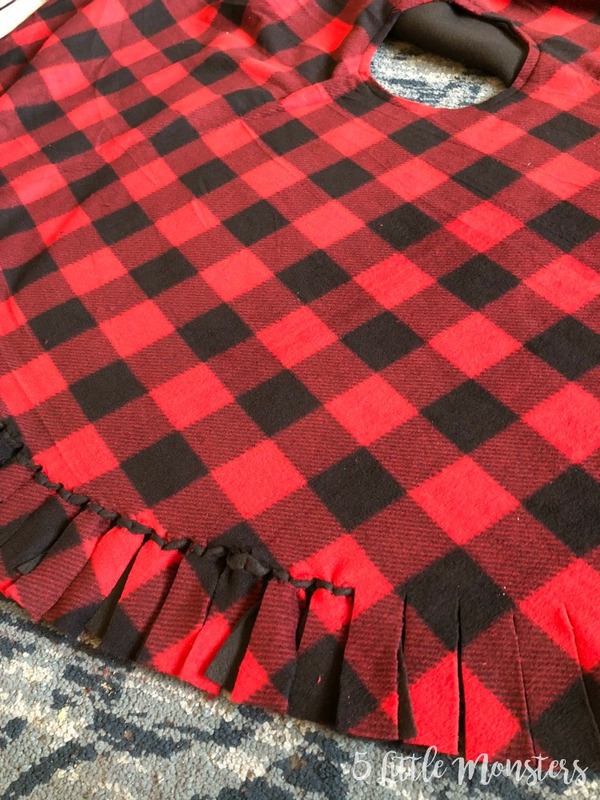 This will bring the plaid back to the top. Once your fringe is tied all the way around go back to the sewn line and cut one last fringe on each side of the stitching, then cut of the stitched section even with the top of the fringe. Cut along the line, between the two lines of stitching. Cut 3 pieces of velcro, about 2" long. 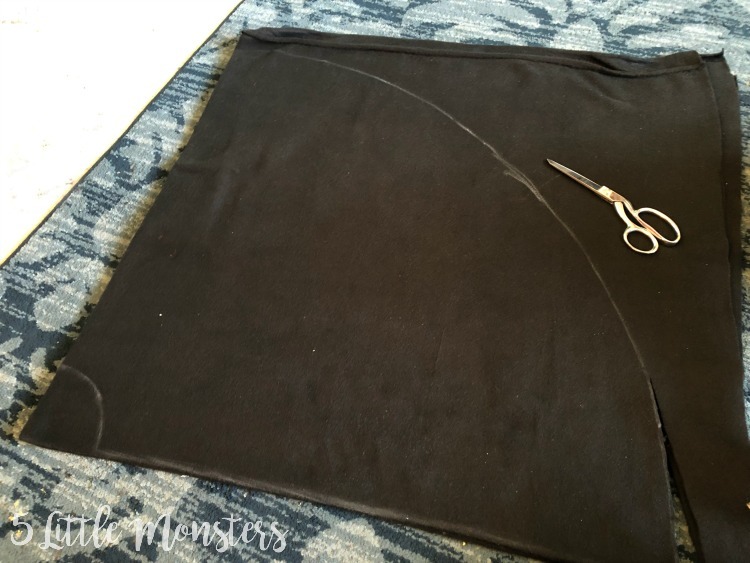 Sew along the cut edges to create a closure for the slit. 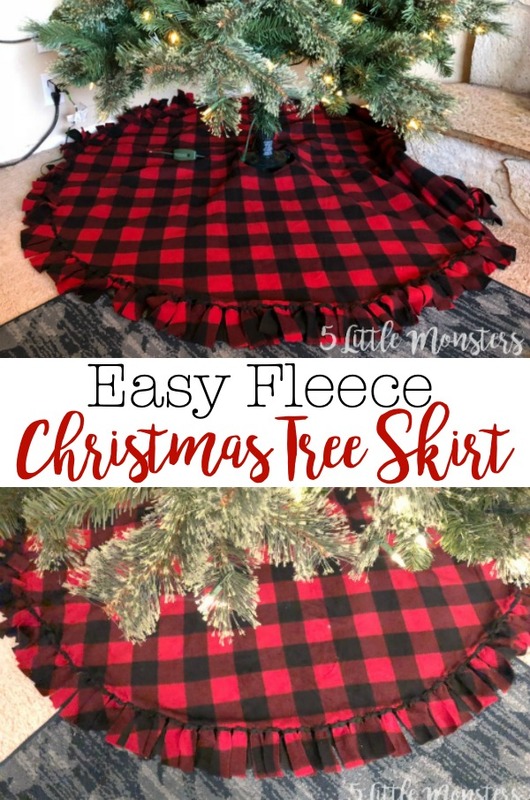 Enjoy your new tree skirt.